Experience nature like never before as you embark upon an adventure to summit one of the many peaks on the Cielo Vista Ranch. 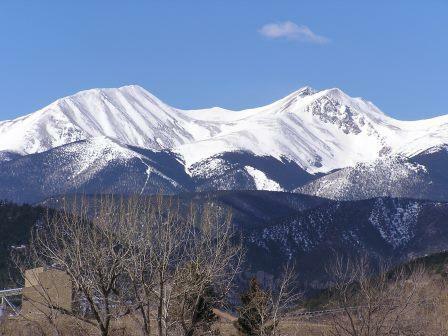 Culebra, (“Serpent” in Spanish) with an elevation of 14,047 feet is the highest summit of the Culebra Range, a subrange of the Sangre de Cristo (Blood of Christ) Mountains in southern Colorado. The snake-like ridge-line for Culebra gives its name true meaning as it winds its way to the summit. The privately owned Cielo Vista Ranch (“View of Heaven”) opens its gates to hikers anticipating an experience that no public land can offer. The scenic journey begins in your vehicle traveling several miles through beautiful aspen groves as you make your way to the trailhead. The sun flickers through the trees highlighting the beauty of the experience. The path you choose is your own and may take you across small streams and across the ridge where an occasional elk, mule deer, or bighorn sheep can be seen as well as many other types of wildlife. Once your hike begins it is evident that this mountain is like no other. With lush vegetation and no defined trail guiding the way up the mountain, one can really become captivated by the beauty and undisturbed environment that surrounds this range. A rare jewel to find, enjoy the freedom of making your own way up to the summit. Once reaching the summit enjoy the heavenly view of other nearby peaks including Red Mountain which can be accessed quickly from Culebra Peak. Before descending back down, jump over and experience Culebra Peak from a different perspective by hiking one of Colorado’s 100 highest peaks: Nestled behind Culebra Peak you’ll find the summit at Red Mountain with an elevation of 13,908 feet. With the convenient access to Red Mountain from Culebra, hikers have the ability to hike both in one day. These two peaks will leave you breathless as you fully experience nature in a way that takes you through some of Colorado’s best and most secluded high country. PLEASE NOTE: THERE IS CAMPING AVAILABLE JUST INSIDE THE GATE FOR CLIMBERS, FREE OF CHARGE. LOOK FOR THE SIGN AND ENJOY. IF YOU HAVE A PARTY OF CLIMBERS, PLEASE HAVE EACH INDIVIDUAL SIGN IN FOR AN INDIVIDUAL RESERVATION. THIS KEEPS US FROM BEING OVERBOOKED AND IS NECESSARY FOR OUR RECORDING SYSTEM. IF YOU HAVE A SPOT TRACKER OR CELL PHONE, BRING THEM ALONG. CELL COVERAGE DOES EXIST ON THE PEAK. Climbing and hiking will become accessible from January through July 31, 2018. Reservations may be made in advance during the winter season. Your reservation may be canceled at any time or prior to the trip, due to unsafe weather conditions. A member of our CRV staff will contact you to discuss safety conditions and cancellations. If in the event that your reservation cannot be rescheduled, a refund will be made. Please ignore the link below for the winter climbs and hiking trips, but contact us directly instead. We are scheduling this manually and payment will be made the day of the climb. To book please email cvrproperty@gmail.com for reservation inquiries. PLEASE NOTE THAT THIS YEAR THERE WILL BE NO CLIMBING OR HIKING IN AUGUST THROUGH OCTOBER DUE TO HUNTS. SORRY FOR ANY INCONVENIENCE.